Written by Jaxon S on July 10th, 2008 in Sabah Claim. The Sultan of Sulu — whoever he may be — has been issuing birth certificates purportedly to his subjects or “tarraayat” or rakyat in Sabah, the Malaysian state on Borneo island. He didn’t call it “katarangan kalahiran” — those are my words — but rather “katarrangan sin kapag-anak” or birth information. Those who know Malay will be able to guess the meaning of katarrangan sin kapag-anak. Below is the low quality birth certificate supposedly issued to a person born in 1994. 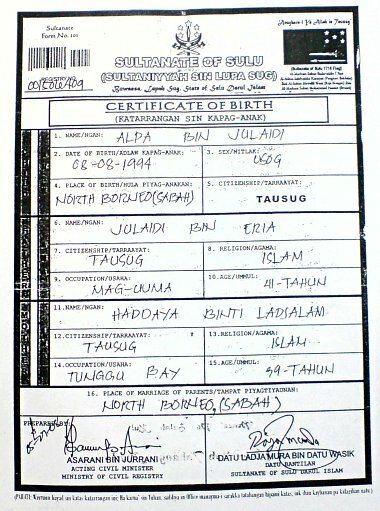 The birth certificate image is originally posted at DAP advisor Lim Kit Siang’s blog, reproduced here without permission. The below than sub-standard birth certificate look as though it was issued in the 1940’s. However, the birth certificate is supposed to be readable digitally, as there seems to be some sorts of a bar code on its top left corner. But I bet no machine in the current world will be able to read those code. Someone from the outer space may be able to decode it. “In Parliament yesterday, I gave the Deputy Home Minister, Datuk Chor Chee Heung a copy of a birth certificate issued by the Sultanate of Sulu & North Borneo/Sabah for children born in Sabah, challenging Malaysian sovereignty in Sabah, as he said he was unaware of the existence of such birth certificates. ya, memang. the sultan is a con as far as i’m concern. doi…… bila lar ni dorang mo give up. kawawakz namanz yungz mgaz stateless sa Sabah. Thatz their homeland so they must not kick out of Sabah!!!! Luv, such a pityz coz theirz ownz country rejected them..